It's been awhile! I've been busy! A couple of days after the Hall of Fame City Challenge Half Marathon, I left for a work trip to Tulsa, Oklahoma. Since my daughter lives in Oklahoma City, I extended my trip through the next weekend to be able to visit with her and her husband. Coincidently, her husband's parentsw ere in town at the same time so we all got to visit. My daughter had to work on Friday so that gave me some time to explore the city. I went to the zoo which was really nice, and then to the Stockyards for lunch and to invest in some awe-then-tick cowboy boots! I got to sport them later that night at the Oklahoma State Fair! On Saturday, my daughter too me on an almost 7 mile sightseeing run. Run is relative though. We had some bursts of running but mostly it was a very slow jog while taking pictures around the city. We finished with a refueling breakfast of breakfast burritos and margaritas. One of my most fun runs, ever. Last weekend, I felt the need to get in a good, long run. Since it was raining on Saturday and I avoid running in the rain at almost all costs, Amanda and I ran together on Sunday. We got in a good, comfortable 10 miler. Yesterday, 5 of us ran the Akron Marathon Relay. I had leg 3. It was a perfectly, beautiful day and I felt wonderful on my run. I maintained a sub 10 m/m pace for the 7.5 mile length! Next up is the inaugural Cleveland Rock and Roll Half Marathon one week from today. I hope the weather is as perfect as it was yesterday! 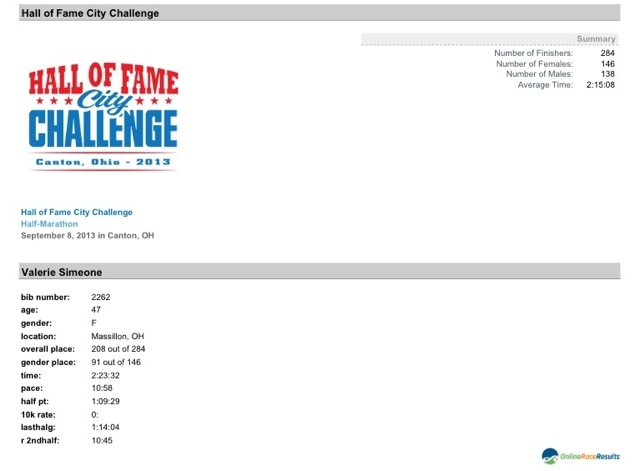 My next Half Marathon is only THREE weeks away! I had a really good 11 mile run yesterday. My legs are a little sore today. It just makes me look forward to my taper week in two weeks. A 12 mile run coming up this weekend then we'll be celebrating Labor Day on the Bourbon Trail in Kentucky! I'm excited that our trip corresponds with my taper week. I'm really looking forward to a run in Kentucky. It was beautiful running there last year but I'm glad to only be doing about 6 miles or so instead of giving up 2+ hours of my vacation. I'm still working on my clean eating diet - or should I say, lifestyle! It's a work in progress but it has been going really well! Dinner today was salmon, corn on the cob and cabrese salad. I did need to have a small glass of wine. I haven't researched if wine is "clean" or not but I'm guessing it's probably not. I'm really hoping that next weekend's 12 mile run goes as well as the 11 miler this weekend! Have a great week, everyone!